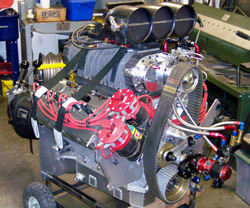 Testing is done on an engine which is not running, and normally with the tested cylinder at top dead center, although testing can be done at other points in the compression and power stroke. Pressure is fed into a cylinder via the spark plug hole and the flow, which represents any leakage from the cylinder, is measured. Leakage is given in wholly arbitrary percentages but these “percentages” do not relate to any actual quantity or real dimension. The meaning of the readings is only relative to other tests done with the same design of tester. Leak-down readings of up to 20% are usually acceptable while greater than that requires a repair. Racing engines would be in the 1-10% range for top performance. While the leak-down tester pressurizes the cylinder, the mechanic can listen to various parts to determine where any leak may originate. For example, a leaking exhaust valve will make a hissing noise in the exhaust pipe while a head gasket may cause bubbling in the cooling system. A leak-down tester is essentially a miniature flow meter similar in concept to an air flow bench. The measuring element is the restriction orifice and the leakage in the engine is compared to the flow of this orifice.There will be a pressure drop across the orifice and another across whatever leaks in the engine. Since the meter and engine are connected in series, the flow is the same across both, the pressure drops will also be equal if, for example, the size of the unknown leak would be the same as the known orifice. This would give a reading of 50 which gives the same pressure drop across each element(both the leak and the orifice). Conversely, if there is no leakage there will be no pressure drop across either the orifice nor the leak, giving a reading of 100 or 0% leakage. There is no standard regarding the size of the restriction orifice for non-aviation use and that is what leads to differences in readings between leak-down testers from different manufacturers. Most often quoted though is a restriction with a .040in. hole drilled in it. Some manufacturers use only a single gauge. In these instruments maintaining the input pressure is (hopefully) maintained automatically by the pressure regulator alone. Any error in the input pressure will produce a corresponding error in the reading. In instruments with two gauges the operator manually resets the pressure to 100 after connection to the engine guaranteeing consistent input pressure and greater accuracy. Most instruments use 100psi as the input pressure simply because ordinary 100psi gauges can be used which corresponds to 100% but there is no necessity for that pressure beyond that. Any pressure above 15psi will function just as well for measurement purposes although the sound of leaks will not be quite as loud. An engine pressurized to 100psi must be locked at exactly top dead center or it will rotate under the pressure. This presents a serious danger to the operator. Using less pressure is less dangerous and opens the possibility to test at positions other than top dead center.